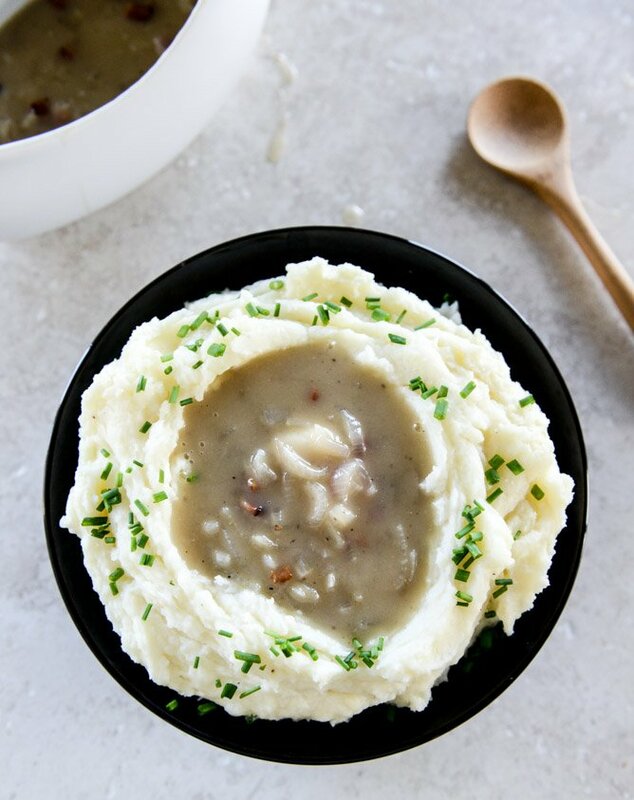 Roasted Garlic Goat Cheese Mashed Potatoes. Had you asked me twenty years ago what my favorite food in all the land was, I would have loudly proclaimed POTATOES. First, it pains me a little to be able to remember things that actually happened twenty years ago, that it’s even a possibility that I was alive twenty years ago and the fact that I reference things that happened so many moons ago is like… whaaat? But truly. It was potatoes. Potatoes were my favorite food all through childhood and the tween years. I’m talking ANYTHING with potatoes – but mostly potato specific dishes. Clearly, mashed potatoes and baked potatoes were there. Scalloped potatoes, my mom’s hash brown/potato chip cheesy casserole that she STILL makes to this day, the potatoes that were so oddly labeled “funeral potatoes” (only to be served with “funeral chicken”), the crazy loaded and stuffed baked potatoes from places like Wendy’s that I think I begged for once a week but probably only ate once or twice in my life. Things like that. Imagine how blown my mind would have been had I known about hasselback potatoes back then? Cue major major freak out. This was in the formative years of my life, the years where we thought it was a good idea to perm my hair to which then I overhead my mom telling my aunt on the phone that it looked like “Roseanne Barr’s hair,” when I owned so many Lisa Frank folders and notebooks but hated to actually use them because they were so PRETTY (I still have this issue), when I lived for flannel plaid skirts from Limited Too and just begged for my own darn pink clear plastic phone from Radio Shack so I could forever be DJ Tanner. P.S. the year I did actually get a phone for Christmas was amazing, albeit not clear pink acrylic, but there was no phone jack in my room so I’d plug it in the upstairs hallway jack and lay with my feet up against the wall while talking for hours. Obviously the days before texting. That was sort of wonderful but, wow… you couldn’t pay me to talk on the phone for four hours today. Yep. THOSE were the years that potatoes ranked up there as number one for me. I’m still a potato lover, but not like I was back then. I don’t remember when they started to take a back seat but to things bacon and beans and pork and avocado and strawberries but it was most likely when I outgrew my ten-year old palate and started craving more flavor. More flavor, like buttermilk bacon blue smashed potatoes! Yes, when I look now, I seem to still have a bit of a potato obsession here on this rambly internet page. It creeps in every year around the holidays and hangs out through the freezing weather when only comfort foods will do. These ones here, mashed in all their glory with tons of caramely roasted garlic cloves and creamy goat cheese, fall somewhere in the middle of the potatoes that I’ve shared in the past. If you want to break all tradition on Thanksgiving, the buttermilk bacon blue ones will do. If you want to keep it simple, i.e. 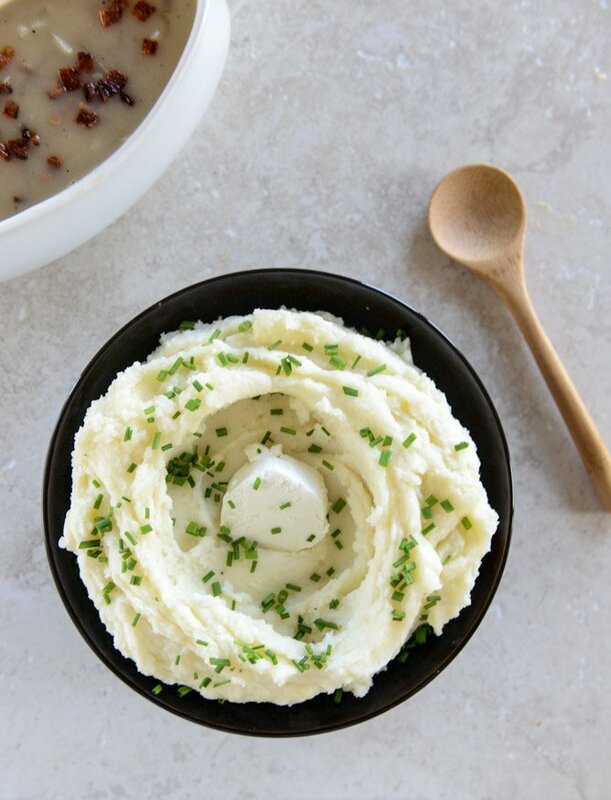 if your family just wants Thanksgiving to taste like it did in 1985 (which isn’t so terrible, I say), these brown butter mashed potatoes are where it’s AT. Because they are simple but have a little extra punch that makes you go… why the heck are these plain potatoes so good? If you fall in the center like me, craving nostalgic tradition but always wanting something new and exciting, something “so not boring” and plain, then puhlease whip some goat cheese into your potatoes ASAP. 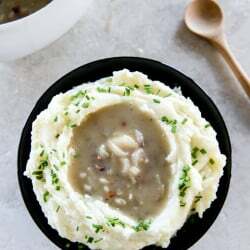 The goat cheese adds the most wonderful creaminess, a tang that is somewhat reminiscent of sour cream or greek yogurt but is stirred into your potatoes instead of plopped on top. I don’t know how much explanation the roasted garlic needs because it’s pretty much flavor to the max. 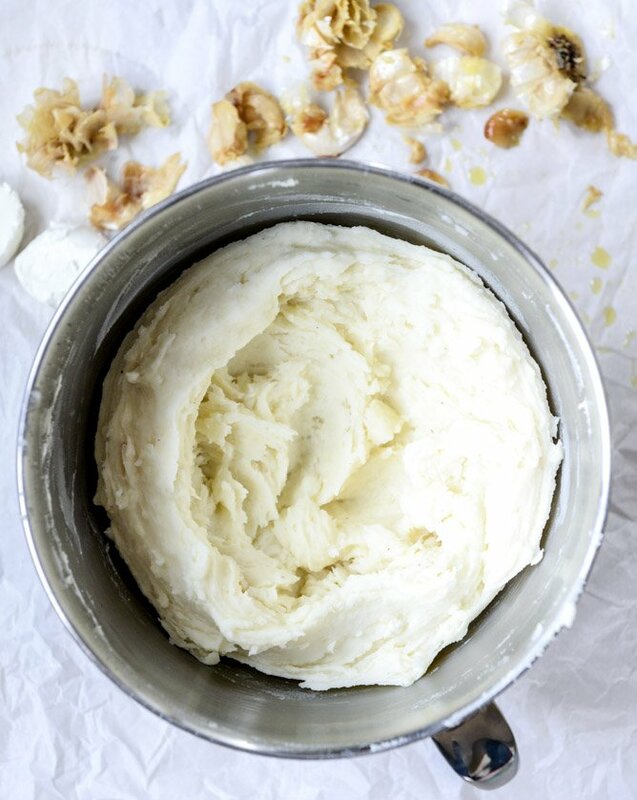 When mashed and mixed into with salty mashed potatoes and creamy goat cheese, it is undeniably incredible. I threw some chives on for looks and greenery – you can certainly stir more in or leave them out totally. And obviously gravy is the BEST part (I learned this early on when my mom talked about eating fries covered in gravy in college, long before poutine was a thing here), but these potatoes can also stand on their own. Best of both worlds, right? 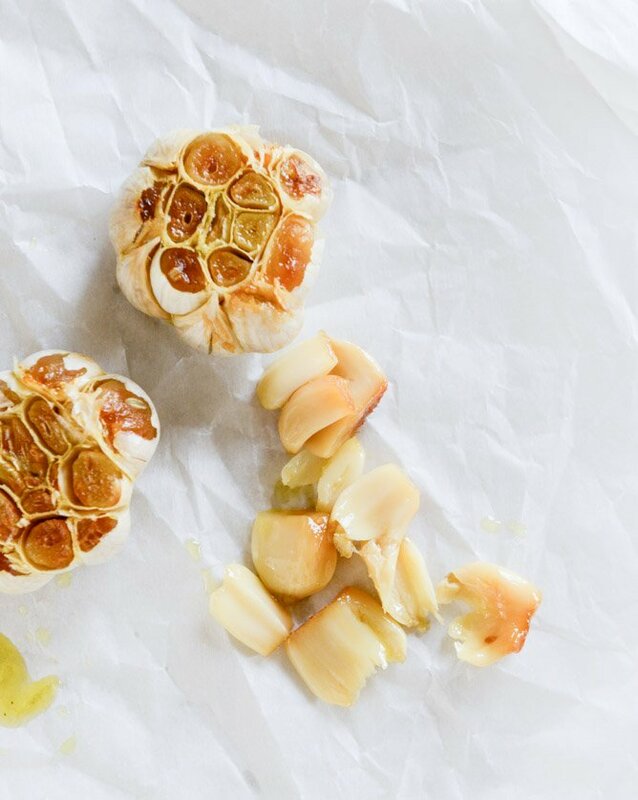 Preheat the oven to 350 degrees F. To roast the garlic, slice the tops of the heads of the bulbs off. Use your fingers to rub the “paper” off of the sides – as much as you can get off is fine. 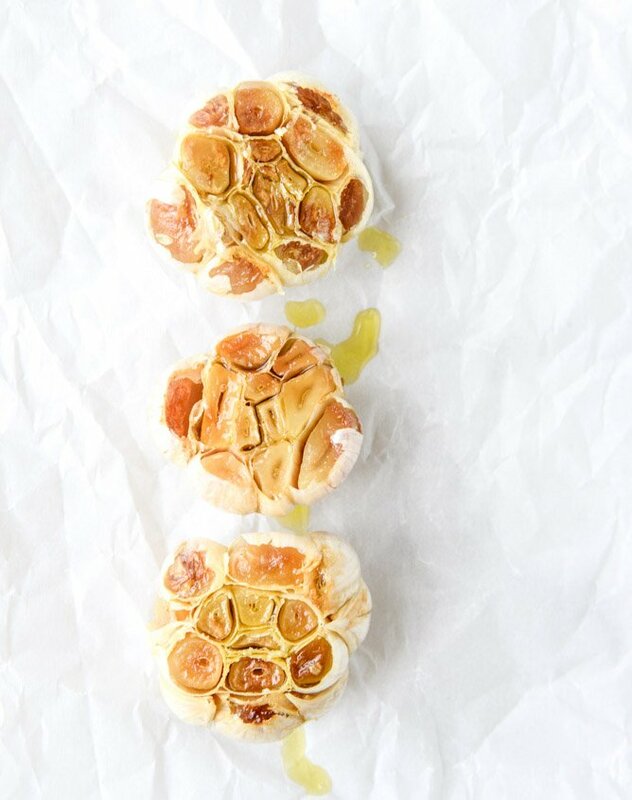 Drizzle the exposed cloves with olive oil and wrap each bulb in aluminum foil. Roast for 45 to 50 minutes, or until the exposed cloves are golden and caramely. Remove and let cool until you can safely touch them. Once cool, squeeze the roasted cloves out of the bulbs, making sure to remove any paper. Add the potatoes to a large pot and fill it with cold water – enough to cover an inch or two above the potatoes. Bring to a boil and boil until the potatoes are fork-tender, about 25 minutes or so (depending on the size of your potato chunks). Once tender, drain the potatoes. 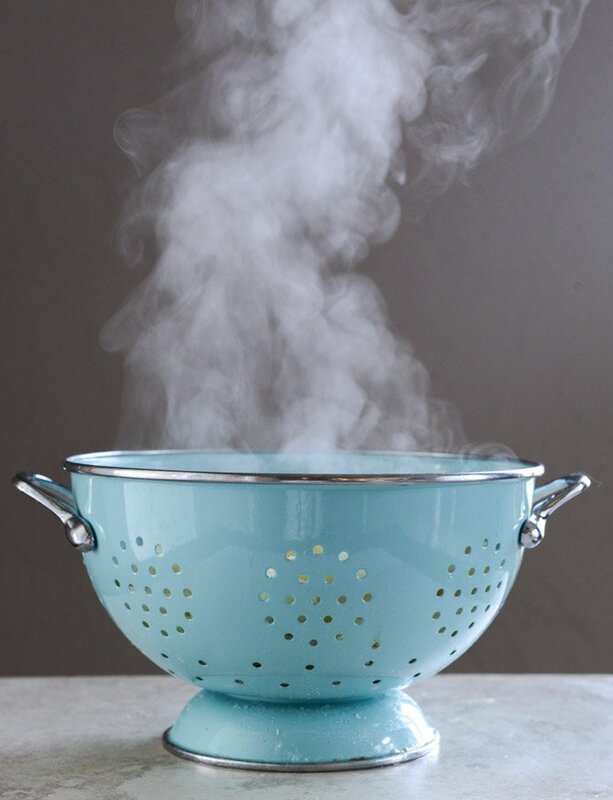 Add the potatoes to the bowl of your electric mixer (you can obviously use a hand masher or a hand mixer if desired) fitted with the paddle attachment. Mix for a minute or two until the potatoes start to break down and come together, then add in the goat cheese (I like to leave a chunk out for topping) and garlic cloves. Mix on medium speed until the potatoes are creamy. Reduce the speed to low and mix in the half and half, butter, salt and pepper. Mix for another few minutes until totally creamy and no chunks remain. 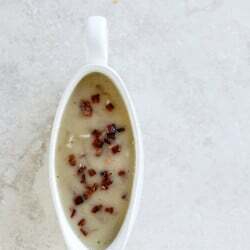 Taste and season additionally if desired – you may need more salt and pepper! Spoon the potatoes into a bowl and top with the chives and extra piece of goat cheese. Serve immediately. Cover my life in gravy please. could i make these ahead of time (maybe add more milk?) and bake them in a casserole dish to re-heat? there is a recipe i make for thanksgiving (minus garlic but plus brie and thyme) that holds up decently well to that – PLUS CRISPY TOP!! yes! i definitely think that will work – when i reheat potatoes i sometimes add extra milk, so if anything, i’d add it once reheated to make it creamy. Is 6lbs of potatoes correct? That seems like a whole lot. I wanted to make these tomorrow but am worried about how much to buy! Thanks! I make these potatoes every year for Christmas and other special occasions. They’re known as my Christmas potatoes and so many people have had the recipe from me since 2014. It’s Christmas Eve, so I’m making them again, and I realised I never thanked you for what has become a much loved family recipe. These are the best mashed potatoes ever. Oh and to those who ask, they reheat beautifully, just with a splash of milk, hence me making them a day early!